Jason and his fellow hunter's dubbed this buck "Moonlight" because it never appeared in daylight trailcam photos. Bowhunting big whitetails in Illinois has always been a dream of mine, and the after hunting a few years in this area, I've been fortunate enough to have taken a couple of nice bucks. 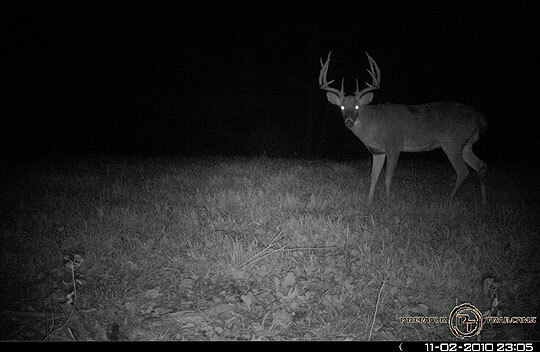 But at daylight on November 7th, 2010, I found myself staring down a true trophy class whitetail. My hunting party planted several food plots on a new track of property we leased in August and before leaving, we placed several game cameras to get an inventory the bucks living on the property. When we returned the first Weekend of October, we were surprised at the number of good quality bucks that were on the farm, and one in particular that caught our attention. We called the buck "Moonlight" as we had several nighttime photos, but no daylight images. With the rut arriving, I opted to hunt a portion of a cut cornfield where my hunting buddy had viewed a couple of nice bucks crossing the field the week before. I setup a buck decoy at the edge of the cornfield just at the break of day, and hadn't been in the stand for more than 10 minutes when I caught movement coming out of the timber and crossing the field. As I turned and got my binoculars up for a better look, the monster saw the decoy, turned, and made a straight line to him. At this point, the binoculars weren't needed and I quickly reached for my bow. At roughly 60 yards, the deer stopped to survey the situation and I wasn't sure I'd get a shot at this monster. After a few seconds that seemed like hours, the deer continued walking to the decoy, and as he circled, I was able to draw, settle my 40-yard pin down behind his shoulder, and squeezed the release. I was speechless when I saw the perfect flight of the lumenok, but as the arrow hit the deer in the front shoulder, I realized the deer was quartering to me a lot more than I thought. The arrow entered into the deer's shoulder area, and as the deer turned to run, he immediately hit the ground with the front end with the lumenok standing proud. At this point, as the deer was barely able to push himself across the cornfield, I realized how big this deer was. As I heard the deer hit the timberline, and get quiet, I struggled to see over the crest of the hill. Not knowing if the deer was down or entered the timber, I opted to walk back to the camp and wait for the rest of my hunting party before tracking the deer later that morning. When we returned, we located the broken arrow in the middle of the field, and looked up to see the deer lying just at the timber line, a mere 70 yards from where I shot him. My brother was the first to race to the deer and realized that the deer that he had in his hands was actually "Moonlight", the very deer I had set my eyes on for hunting back in October. This was the first sighting of "Moonlight" on the property in daylight hours, and thanks to the decoy and my Alpha Max Bow, was his last. The deer ended up gross scoring 181 7/8 inches as a typical 9-pt frame. With my Dad and brother there in the field to share in the joy, it will be a hunt that will always be remembered.